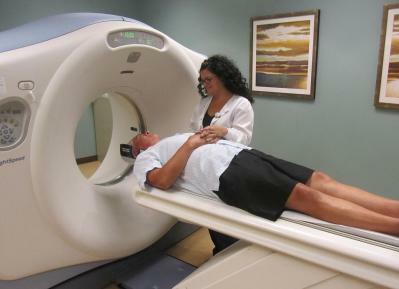 CT (Computed Tomography)-sometimes called a CAT scan, is a noninvasive, painless medical test that helps physicians diagnose and treat medical conditions. CT imaging uses special x-ray equipment to produce multiple images or pictures of the inside of the body and a computer to join them together in cross-sectional views of the area being studied. The scan generally takes around 15 minutes to complete, and you will be asked to hold still and hold your breath during portions of the exam. The technologist begins by positioning you on the CT examination table, usually lying flat on your back or possibly on your stomach. 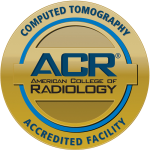 You will be alone in the exam room during the CT scan, however, the technologist will be able to see, hear and speak with you at all times via a 2-way intercom system. The table will then move slowly through the machine as the actual CT scanning is performed. Some CT scans require an iodine-based contrast material. If IV contrast is required a nurse or technologist will insert an IV into a vein in your arm or hand. If oral contrast is required you will need to arrive an hour prior to your appointment time in order to drink the contrast. It is very important to let your doctor know if you’ve ever had an allergic reaction to contrast or any other allergies, especially an allergy to iodine-based products or shellfish.